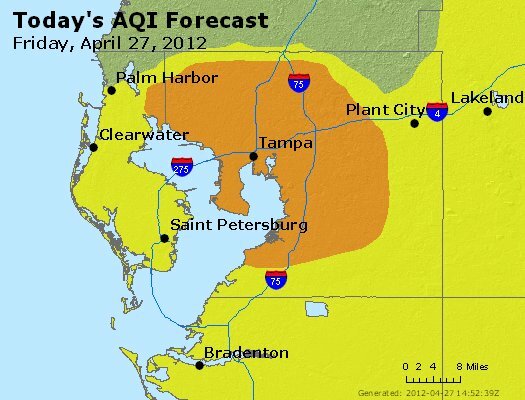 (Tampa) The Environmental Protection Commission of Hillsborough County issued an Air Pollution Advisory Thursday April 26 and again Friday April 27 due to anticipated levels of ozone pollution. According to the advisory, ozone levels are expected to reach levels of 101-150, considered unhealthy for sensitive groups, including children, elderly, and those with existing respiratory ailments such as asthma and COPD. These conditions are now forecast to persist through Friday. This week’s high ozone levels are due a combination of typical spring weather: calm winds, low humidity, and lots of Florida sunshine combined with accumulations of nitrogen oxide (NOX) and volatile organic compounds (VOC). NOX and VOC are converted through exposure to sunshine to ground level ozone, also known as smog. Unlike most of America, where coal burning power plants are the source of NOX and VOC that create summer smog, Florida’s riskiest season for smog is in the spring months of April, May and June until summer thunderstorms help keep the air cleaner. Thanks to local utilities’ efforts to reduce emissions and the lack of transportation alternatives that most U.S. communities offer, gas-powered cars and trucks are believed to be as significant a source of NOX and VOC in the region as are coal-fired power plants. 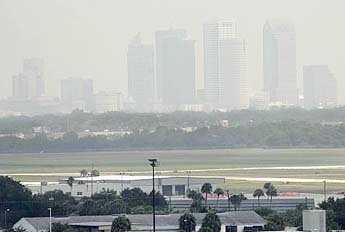 Sierra Club joins the Florida Department of Health in recommending that all schools, child care centers, and parents of children with asthma stay on top of our potentially hazardous springtime ozone levels with the EPA's smartphone app or website @ http://www.airnow.gov/ for the daily air alert. Rev. Andy Bell adds, “I am an adult with asthma who is extremely compliant with my meds. Thursday afternoon I was struggling to breath, and I didn’t understand why until I learned of the Air Pollution Advisory. I and many others don’t have the luxury of taking a full breath for granted. Clean air is life”. Rev. Bell is the Executive Director of Sunshine State Interfaith Power & Light, Inc. whose mission is to mobilize faith communities to address the climate crisis and to care for creation in Florida.